Go to original pattern for design DROPS 130-23. Knitted DROPS jacket in ”Alpaca Bouclé.” Size: S - XXXL. Bust: 106-112-122-132-144-156 cm / 41 3/4"-44"-48"-52"-56½"-61 1/4"
DROPS STRAIGHT NEEDLES size 5 mm / US 8 - or size needed to get 17 sts x 22 rows in stockinette st = 10 x 10 cm / 4'' x 4''. DROPS STRAIGHT NEEDLES size 4.5 mm / US 7 - for edges. Bind off for button hole on right band from WS as follows: 1 button hole = K 2, K 2 tog, 1 YO. Cast on 82-86-96-104-114-124 sts on needles size 4.5 mm / US 7 with Alpaca Bouclé. Work 4 rows in GARTER ST - see explanation above. 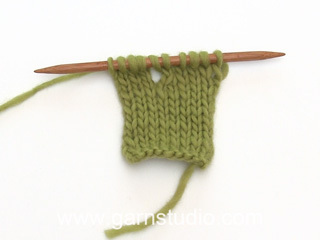 Switch to needles size 5 mm / US 8 and work in stockinette st. REMEMBER THE GAUGE! When piece measures 6-5-5-7-7-8 cm / 2 3/8"-2"-2"-2 3/4"-2 3/4"-3 1/8", inc 1 st in each side. Repeat inc every 4-3½-5-4½-5-5 cm / 1½"-1 1/4"-2"-1 1/4"-2"-2" a total of 4-5-4-4-4-4 times = 90-96-104-112-122-132 sts. 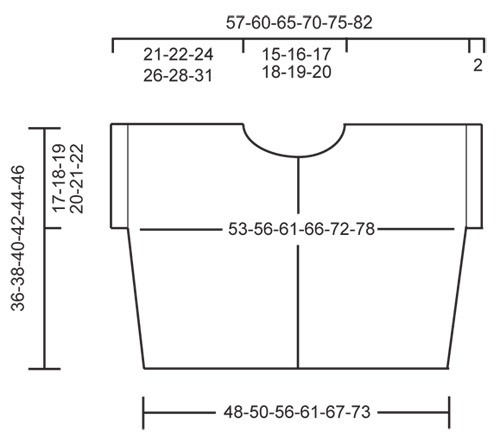 When piece measures 19-20-21-22-23-24 cm / 7½''-8''-8¼''-8¾''-9''-9½'', cast on 3-4-3-4-3-4 sts in each side for sleeves = 96-104-110-120-128-140 sts. 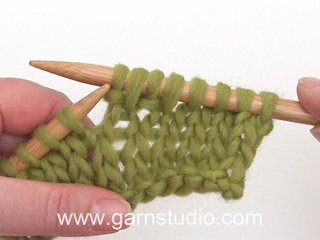 Continue in stockinette st - work the outermost 4 sts in each side in garter st. When piece measures 35-37-39-41-43-45 cm / 13¾''-14½''-15¼''-16 1/8''-17''-17¾'', bind off the middle 24-26-26-28-30-32 sts for neck and finish each part separately. Then bind off 1 st on the next row towards the neck = 35-38-41-45-48-53 sts remain for shoulder. Bind off when piece measures 36-38-40-42-44-46 cm / 14¼''-15''-15¾''-16½''-17¼''-18''. 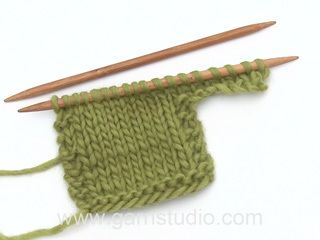 Cast on 45-47-52-56-61-66 sts (including 4 band sts) on needles size 4.5 mm / US 7. 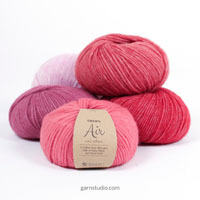 Work 4 rows in garter st, switch to needles size 5 mm / US 8 and continue in stockinette st - but work band sts in garter st. When piece measures 6-5-5-7-7-8 cm / 2 3/8"-2"-2"-2 3/4"-2 3/4"-3 1/8", inc in the side as on back piece = 49-52-56-60-65-70 sts. Continue until piece measures 19-20-21-22-23-24 cm / 7½''-8''-8¼''-8¾''-9''-9½'', cast on 3-4-3-4-3-4 sts in the side for sleeve = 52-56-59-64-68-74 sts. Then work the outermost 4 sts of sleeve in garter st. Continue to work until piece measures 27-28-31-32-34-35 cm / 10 5/8"-11"-12 1/4"-12½"-13 3/8"-13 3/4". Now bind off 6-6-6-6-7-7 sts for neck = 46-50-53-58-61-67 sts. Continue to bind off towards the neck on every other row: 4 sts 2 times, 1 st 2-3-3-4-4-5 times, and after 4 rows: 1 st 1 time = 35-38-41-45-48-53 sts remain for sleeve. Bind off when piece measures 36-38-40-42-44-46 cm / 14¼''-15''-15¾''-16½''-17¼''-18''. Cast on and work as left front piece but reversed. NOTE: bind off for 1 button hole on band when piece measures 26-28-30-31-33-35 cm / 10 1/4"-11"-11 3/4"-12 1/4"-13"-13 3/4" - see explanation above. Sew the shoulder seams. Sew side seams in front loop of outermost st to avoid chunky seams. NECKLINE: Pick up approx. 70 to 90 sts from RS around the neck on needle size 4.5 mm / US 7 with Alpaca Bouclé. Work 4 rows in garter st. Loosely bind off. .... When piece measures 6-5-5-7-7-8 cm / 2 3/8"-2"-2"-2 3/4"-2 3/4"-3 1/8", inc in the side as on back piece = 49-52-56-60-65-70 sts. Do you have this pattern in english or spanish? Thank you! Dear Mrs Bate, this pattern is available in both UK and US English as well as in spanish, just edit language clicking on the arrow below picture to choose the appropriate language. Happy knitting! Je souhaite commencer ce modèle. J'ai néanmoins une question concernant les mesures. 48 cm pour le bas me semble grand pour moi. Il me suffirait de 41 cm De même pour les 53 cm sous les bras. 48 cm me suffirait. Si je décide de commencer avec moins de mailles ( en faisant une règle de trois) es ce que je continue les augmentations comme décrit dans les explications ? ( la hauteur de 36 cm me semble ok). Merci de votre retour. je suis impatiente de commencer. Bonjour Liz, nous ne sommes pas malheureusement pas en mesure de pouvoir ajuster chaque modèle à chaque demande individuelle, mais vous pourrez certainement ajustez à vos propres mesures en suivant le schéma, les explications et les mesures souhaitées. Votre magasin DROPS saura vous aider si nécessaire, même par mail ou téléphone. Bon tricot! Sì può realizzare anche con ferrì circolari? Buongiorno Dea. Può sostituire i ferri dritti con quelli circolari e seguire le stesse spiegazioni. Buon lavoro! 1. Was sind Blendmaschen? 2. Sind auch die Randmaschen enthalten? 3. Wenn alle 3,5 cm 1 M zugenommen wird, dann muss bei Gr.M nach 20 cm die letzte M zugenommen werden und soll dann gleichzeitig nach 20 cm 4 M für den Ärmel zugenommen werden? Blenden heißen die vorderen Abschlüsse an den Rändern der Vorderteile. Rand-M sind normalerweise bei unseren Anleitungen enthalten. Die Zunahmen sind schon eher fertig: Die erste Zunahme machen Sie bei 5 cm. Dann folgen noch weitere 4 Zunahmen (insgesamt 5) im Abstand von je 3,5 cm = 14 cm + 5 cm = 19 cm. Weshalb kann ich die Anleitung nicht ausdrucken? Sofern Sie anderweitig keine Probleme mit Ihrem Drucker haben, sollte es kein Problem sein, die Anleitung auszudrucken - Sie wählen den Knopf "Drucken: Anleitung" rechts unten neben dem Foto, dann erscheint ein Fenster, in welchem Sie noch mal auf "Anleitung drucken" klicken. Dann erscheint die Druckversion bzw. je nach Ihrer Computereinstellung die Anzeige, mit welchem Drucker nun gedruckt wird. When you say "When piece measures 6-5-5-7-7-8 cm, inc 1 st in each side. Repeat inc every 4-3½-5-4½-5-5 cm a total of 4-5-4-4-4-4 times = 90-96-104-112-122-132 sts" What do you mean? 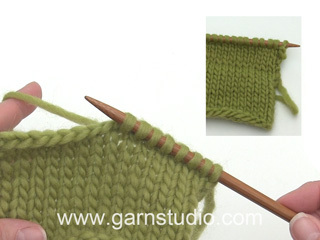 Is it that at the same line you add 1 st 4 times or is it that every 4 cm knitted you add 1 st at each side for 4 times? Dear Atha, you work 1 row increasing 1 st at the beg + 1 st at the end of row (=each side), and repeat these inc a total of 4-5 times (see size), ie repeat the inc every new 4 cm worked. Happy knitting! Just what I was looking for! 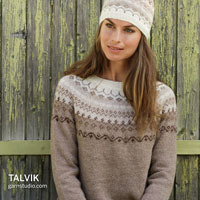 A nice quick knit for those chilly nights near the lake, or on a cloudless desert night where the temperatures drop drastically.